I recently purchased a Polish P-83 off of Gunbroker. I received it a couple weeks ago and performed a detailed strip and cleaning. 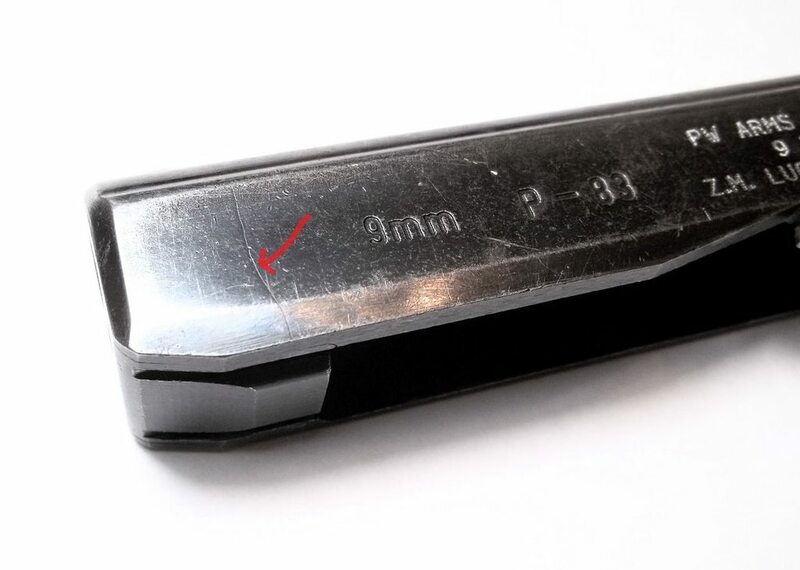 After my first range session with it, I came home and was looking at the pistol and found that the slide had cracked at the front where the solid plug that the barrel passes through is welded to the sheetmetal of the slide. I have included a pic below. I have tried everywhere to find a new slide with no luck. I am posting here in the hopes that someone might have a spare that they would be willing to sell me. If you do, please reply back this thread or contact me at tcs33@tx.rr.com! I queried my FFL (who does TIG welding) and he said he wouldn't touch it. I'm afraid the slide is toast. Re: Polish P-83 Slide Cracked (Pics! )- Need help to find a spare! I was able to find a "Gunsmith Special" P-83 on Gunbroker. Picked it up for $125. It's got a broken firing pin or firing pin spring according to the seller. He didn't want to mess with it. I got lucky to find it. Thanks for all the help from all the sight members...umm...yeah right. Remember sir this is a P-64 site and not everyone here has a P-83 nor knows much about them. Your sarcasm is not necessary nor appreciated. I am glad you found the parts gun and can get it back up and running. One of our other Brothers, OG17 also had a problem with his P83 and he also ended up getting another gun because the problem with the original was beyond the knowledge base here. The P83 is not as widely known or owned here so it is not surprising that you got no replies especially given your problem was catastrophic. That's crazy. I own a P-83 as well and never would have thought the slide could crack like that. Yes, they are stamped sheetmetal guns but still. I reload 9x18 among a bunch of other calibers and after seeing this I think I'll stick to only mild loads in my P83 from now on.